This raid task is of Planes of Power Elemental-to-Time difficulty. 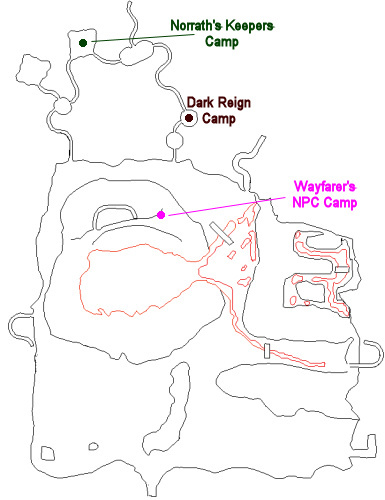 It begins with Lieutenant Ekiltu Verlor (click for map image) in the Norrath's Keepers camp of the Lavastorm Mountains. This task has a 3-day, 20-hour lockout timer. You have been assigned the task 'Guardian of the Sands'. There have been several sightings of a massive guardian that has risen in the sand gardens of Stillmoon Temple. This guardian has been very protective of the area and we have lost contact with several scouts that were sent to gather more information. The scouts that have survived the attacks report that the guardian is allied with the sand goblins of the region. It is simply too dangerous to continue our exploration of the temple as long as that guardian is around. We need you to remove it. Warning! While in this zone, keep off the sand. Stepping on the sand causes multiple goblin spawns that aggro your party (additional to static spawns already found in the zone's base population). Clear your way to "Shogurei, Guardian of the Sands" (far northeastern part of the zone), and engage him (he is NOT rooted in place, so can be pulled - unknown if any leash range), and kill him. This is a fairly straightforward encounter. The task completes upon his death. Shogurei, Guardian of the Sands has been slain by _____! Your faction standing with Stillmoon Acolytes has been adjusted by -1. Your faction standing with Kessdona has been adjusted by -1. Your faction standing with Rikkukin has been adjusted by -1. With the guardian out of the way, exploration of the temple can continue. My guild is progressing through DoN right now. None of us are uber so we do require more than 1 group to get the big targets. Last night, we did this one. Clear your way through the courtyard, into the first room, into the hall way, head right. Eventually you will get to a very large room that has two north halls, the one on the right going no where, the one on the left going up to a tiny room then a short hall then the big boss room that has two rooms on its right wall. Park your raid/group in the tiny room in that hall way on the left. This is will you will fight the named. The large rooms to the north and to the south have an infinite loop spawn cycle for gobbies and standing in those rooms will ensure that there are x number of gobbies spawned at any point. Once you the target in this room, zerg, very easy fight. Note that if you DO stand in the two aforementioned rooms, gobbies will spawn forever. Gobbies who drop things like blue diamonds and excellent animal pelts. They will come to you, no need to pull them. I honestly don't know how this could POSSIBLE benefit anybody... hint, hint. Did this with 84 bard, 84 cleric alt, 73 shadowknight alt, and 74 rogue main (just returned). used mercs to fill the last 2 spots to get the task, then raid booted mercs and the 4 of us killed it. bard tanked, hit % was 30.3%, max hit was avg hit was 935. That is incorrect. It's a raid task with the 6 hr timer like any other DoN raid. As for strategy, basically just clear from the zone in to Shogurei's room. A simple strategy I saw work recently is to pull Shogurei into the room where you would camp for the IH5 augment and pin him to the wall facing the MT while everyone else beats on him from behind (conic type dd will then only hit MT). He does not hit that hard. Stay on the elevated ground only as the other portion is considered "sand." If you step on "sand" a goblin add will pop. So to reduce unnecessary adds, stay off the "sand." does anyone have any info on the encounter/strat maybe even min/max hit done by this guy? Ok - the raid is for both good and evil - the faction you have listed up here is misleading - all of DON miniraids 24-42 and Dragon raids can be gotten by both Good or Evil. The success will result in a faction shard (so good doesnt always take a bad hit and vice versa). Turning in your shard is what gives you the faction hit - not simply killing in DoN. At the moment, the only NPCs that I know of that give off faction are the guards at each camp that if attacked will give opposing faction. EDIT: All tasks given are the same as well. Guardians of the Sands, Goblin Dojo, Emoush, Volkara, and Trial of Perserverance all drop 6-9 items (6 if 24 man - 9 if 42 man). These items are for either good/evil to turn in to get the character flag for the DoN Progression. Does not matter if mission/raid is started good/evil.